You can't imagine my excitement when I was told this morning they would start Liam on bottle feeds! This is another big step in coming home. He will need to be able to take 8 bottles in 24 hours in order to come home. You start out getting 1 bottle over 24 hours and depending how you do they will then go up to 2 bottles, then 3, etc. 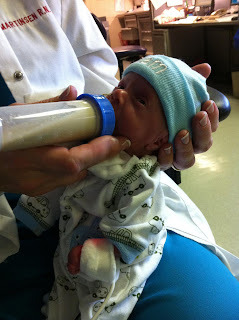 His feedings are 25ml and he was able to take 10 at his first feeding and 20 at the second. Awesome! I was surprised he even got anything. He really amazes me constantly, he is such a fighter.